No Apparent Motive » Blog Archive » Why don’t we feel 63 percent richer? Why don’t we feel 63 percent richer? I don’t think the average non-economist appreciates just how much richer and more productive the U.S. economy is today than it was three decades ago. For the typical American, the large increase in economic inequality has masked most, if not all, of the progress. Janelle Jones and I prepared the table below for a CEPR report (pdf) released today. The table assembles several indicators that all demonstrate a substantial rise in the country’s productive capacity. The share of workers with a four-year college degree or more increased from about one-fifth in 1979 to over one-third in 2010. The median age of the workforce increased by seven years. While we don’t have ideal data, the amount of physical capital (buildings, machinery, equipment, etc.) 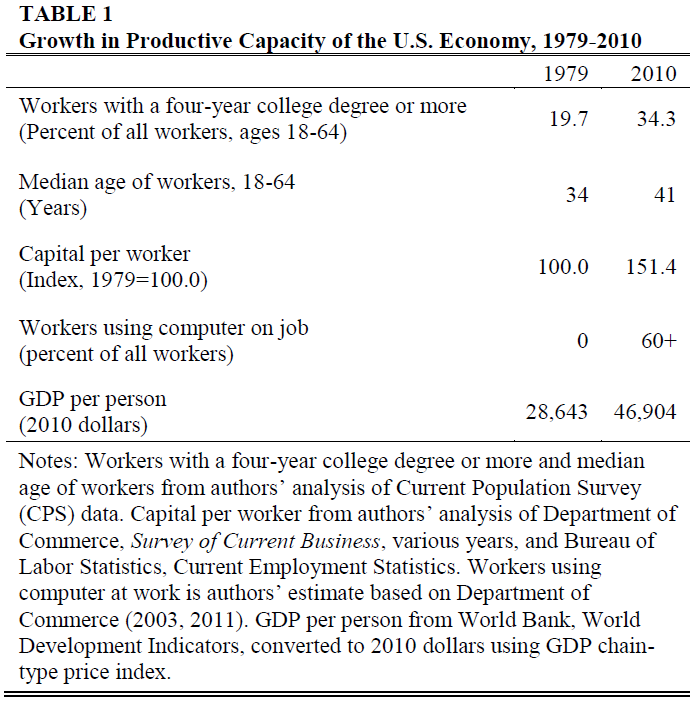 per worker is about 50 percent higher today than in 1979; and more than 60 percent of workers now use a personal computer on the job, compared to essentially zero in 1979. The workforce today is more experienced, much better educated, and working with more –and better– capital. 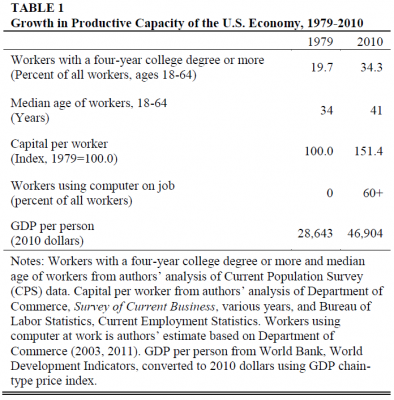 Largely as a result, GDP per capita was 63 percent higher in 2010 than it was in 1979. But, over the same period, the bargaining power of US workers has eroded considerably. Only about 7 percent of private-sector workers are in unions today, compared to almost 25 percent in the 1970s. The inflation-adjusted value of the minimum wage is down more than 15 percent compared to 1979 (and down even more compared to its historical high point in 1968). We’ve deregulated previously well-paying industries (trucking, airlines, telecommunications); privatized many state and local government jobs (school bus drivers, cafeteria workers, and many others); signed trade agreements that put US workers in direct competition with low-wage workers overseas; created an immigration system that deprives immigrants of even the most basic protections while simultaneously putting the squeeze on US-born workers; tolerated a boom in wage theft and related bad behavior by employers; and, almost without exception, pursued macroeconomic policies that have kept unemployment high and jobs scarce. So, it isn’t surprising that most Americans probably don’t get just how much richer we really are.